I spend a significant amount of time these days driving around Fort Lauderdale doing yacht related business and often end up eating at convenient wayside locations. I am more a drive through kind of guy when alone while I like to sit down and take a break with company. Below is a list of 11 eateries which is an incomplete list for sure. Writing this list reminds of me of the local PBS show “Check Please.” If you stay a day in Fort Lauderdale, you will likely end up hearing or eating at these places. Maybe if you are in town this week for the Fort Lauderdale International Boat Show, you will get a chance. The restaurants chosen are mostly marinetime themed and often on the water. 15th Street Fisheries – Higher end restaurant with a live show. Located by Lauderdale Marina just north of the 17th Street Causeway on the Intracoastal. They have gift cards available. Bahia Cabana – A mid-range burger and bar joint located on the beachside of the Intracoastal south of Bahia Mar. Last time I was there, the barmaid was a sweet girl I went to high school with. Solid food at an average price point. Chuck’s Steakhouse – Steakhouse on the north side of 17th Street, west of Cordova. Famous marine spot for a juicy moo-ing piece of beef to salve your ravenous hunger after an offshore passage, you savage you. Dockers – Dania cut-off restaurant integrated with Cozy Cove Marina, south of Taylor Road on the eastside of US1. I like their fish fajitas for a good value and quality lunch. 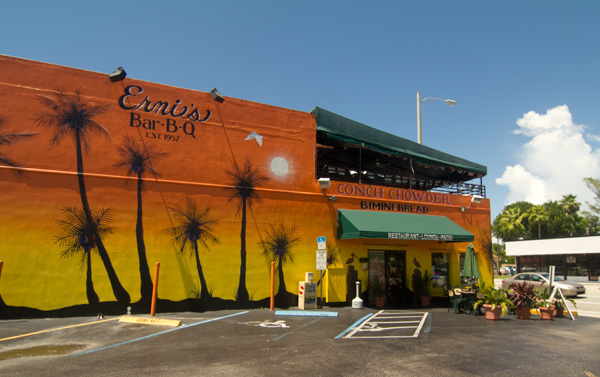 Ernie’s BBQ – My father used to located everything in Lauderdale by it’s compass direction from Ernie’s. You would not expect it, but they have the best conch salad and Bimini bread in town. The trick is that they marinate the salad for days, nay weeks the legend goes. Lester’s Diner – If you are looking for value especially at dinnertime, this New York style diner is a great place with a tremendous selection too. Located on the southside of SR84 with many marine workers renting warehouse space south. My Market – For a tasty though pricey sandwich I frequent My Market. It is a convenience store where eat cafeteria style and pay at the register when you leave. Excellent salads too. Pirate Republic – On South Bank of New River next to railroad bridge and Water Taxi HQ. I lament the “Shirtail Charlie’s” name not being kept. Reminds me of Bahia Cabana. I do not care for the food so much. Pollo Tropical – Had a couple clients fly in to see a boat from Texas, and they requested to get their “Pollo Tropical” fix en route. The location at US1 and 17th is one of my goto drive through places. Incredible, authentic Cuban chicken combo mambo meal at an inexpensive price. Only wish they offered a green vegetable side along with the island chicken, black beans, rice, and sweet roll. Publix Dania Beach – My most common stop if I do not bring dinner left overs to the office for lunch is the nearest Publix. They have a little hot menu area featuring a mean mojo pork, savory pot roast, and many other meals along with two sides. Value is tremendous and healthy if you choose the right options. Southport Raw Bar – Stop in here for a bowl of soup or more. If there is a sailor hang-out, this is it. Located off Cordova south of 17th Street. Value is okay, and the soups are excellent. Other places come to mind and could easily be on the list. Tom Jenkins BBQ tempts you as you drive along US1 past the Davie Boulevard intersection with wafting fumes of sweet, tangy pork. Pomperdale’s, a New York deli up in Lauderdale-by-the-Sea, has huge cholesterol killer sandwiches that necessitate a gastronomic bypass afterwards. Try their Reuben. Where do you like to eat for lunch in Fort Lauderdale?